In 1993, in order to stop an economic freefall on the island of Cuba, Fidel Castro’s government reluctantly instituted a series of reforms to compensate for the demise of foreign aid from Moscow. These policies ushered in a broad spectrum of national and international consumer products and services previously unknown to islanders. In a few short years, Cubans were seeing foreign brands among consumer durables and a broad array of logos brought in by tourists. Today, nearly two decades into these limited market reforms, no systematic research has explored consumer brand awareness among 11 millions Cubans living just 90 miles from the United States. The paucity of academic research stems from the challenges of conducting public/consumer opinion, and official state policy contends that consumer wants and needs are satisfied by either a series of generic and Cuban-made brands, or by independent entrepreneurs who provide brandless products and services. 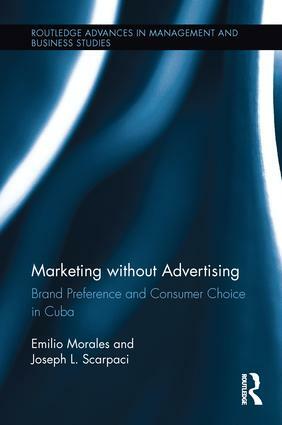 Marketing without Advertising analyzes the role, narratives, and behaviour of consumption in Cuba since 1959. It documents how consumer behaviour has changed since the pre-revolutionary period, with special focus on the early 1990s. The book documents the shift from moral-based rewards in the early years of the Revolution, to the rise of material-based incentives. Cubans have long been exposed to foreign mass media in the form of movies, music videos, cable television shows. Although the Internet is highly regulated, the Cuban Diaspora in exile brings back clothing, personal care products, electronic goods, and magazines that increase the awareness of brand logos, jingles, products, and services. These and related findings from the authors' primary research are ripe with marketing implications such as substitution effects, price elasticity, latent demand for certain products and services, and consumer behaviour.